[AUSTRIA]. JACQUIN, Nikolaus Joseph, Anton von STÖRCK and Johann Jakob de WELL. Rotterdam, Reinier Arrenberg, 1780. Large 8vo (21 x 12.5 cm). Contemporary tanned sheepskin, gold-tooled spine. 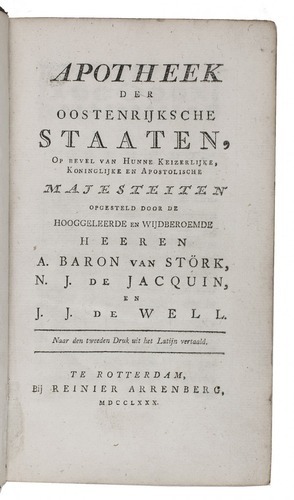 First and only edition of the Dutch translation of the pharmacopoeia for the Habsburg Monarchy, published as part of the medical reforms instigated by Gerard van Swieten (1700-1772), and based on the second edition of 1775. Binding worn, with an imprint circle at the front and the head of the spine damaged; a few spots throughout and ink stains in the lower margin of p. 226, but otherwise a good copy. 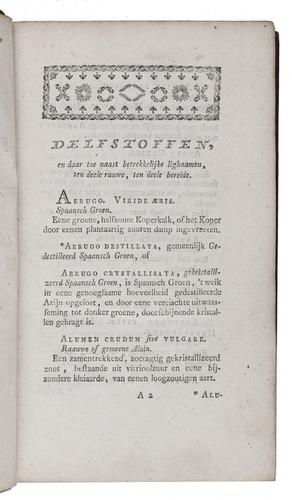 Blake, p. 347; STCN (7 copies); Kletter, "The civil pharmacopoeias of Austria", International society for the history of pharmacy - history of pharmacopoeias; Wellcome VI, 356.